I will have to say Jensen Ackles due to the fact that I seek out looking for other movies/shows they starred in to watch. 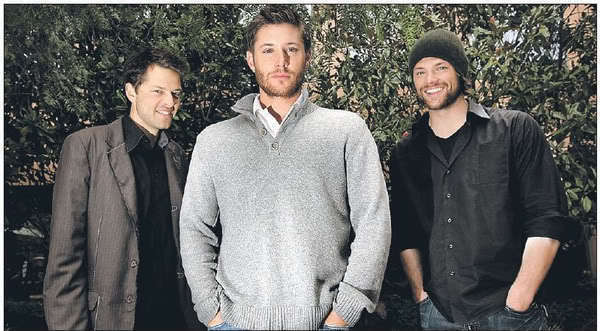 Truthfully though I like Jensen Ackles, Jared Padelecki and Misha Collins. I like their dedication to their fans and dedication to their families. It's nice that they share a little of their world via social media and at conventions, though personally never been to one yet. I'm addicted to Jensen, and I think Misha is just about the most absonorme thing to walk the face of the earth. I have attempted to watch everything of both guys that I could get my hands on, so in that, they run the race equally. There's a lot more of Jensen out there in forms of photography and actual footage of body of work. But there's a lot more of Misha out there in terms of social media and home made vids. But all in all, I probably have to say Jensen tops the list, with Misha running in close second if asked what my favourite SPN actor is. Sorry about Jared. I've seen everything he's done as well, but I'm just not into him that way. I think he's the sweetest guy though, so I respect (ouch) him, and platonically love him. My love for Jensen or Misha is not platonic, to make that perfectly clear. So, yeah, Jensen it is. I agree! All three are awesome. I would say Ackles is my favorite overall. But when Padelecki is on, he's on. His ability to play not!Sam (Sam while possessed), to make it clear that someone else is at home, is amazing.